The Staple, Hole Punch Finisher supports single-position stapling for A4, A5, letter, legal, folio or oficio paper sizes, stapling up to 50 sheets per set (20 lb., 75 gsm). It also offers dual position job offset and job stacking. The output bin supports stacking of paper, card stock and transparencies. 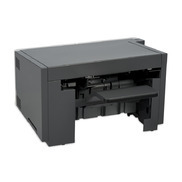 The output bin supports up to 500 sheets of unstapled paper (20 lb., 75 gsm). The stapler can staple a maximum of 50 sheets per set in A4, A5, Letter, Legal, Oficio or Folio sizes. Punching is supported for only paper (16 to 24 lb., 60 to 90 gsm) in A4, Letter, Folio and Oficio sizes. Three hole punch modes are supported; 2-hole, 3-hole and 4-hole. Offset output is supported for A4, A5, JIS-B5, Legal, Letter, Folio, Executive, Oficio and Statement sizes. Staple cartridges contain 5,000 staples. Refill staple cartridges are available in packages of 3 cartridges. Smart sensing indicates when the staple supply is low as well as empty. The Staple, Hole Punch Finisher supports finisher bin 'empty' and 'full' sensing. No other output options can be used with this unit. The output bin supports up to 500 sheets of unstapled paper (20 lb., 75 gsm). The stapler can staple a maximum of 50 sheets per set in A4, A5, Letter, Legal, Oficio or Folio sizes. Punching is supported for only paper (16 to 24 lb., 60 to 90 gsm) in A4, Letter, Folio and Oficio sizes. Three hole punch modes are supported; 2-hole, 3-hole and 4-hole. Offset output is supported for A4, A5, JIS-B5, Legal, Letter, Folio, Executive, Oficio and Statement sizes. Staple cartridges contain 5,000 staples. Refill staple cartridges are available in packages of 3 cartridges. Smart sensing indicates when the staple supply is low as well as empty. No other output options can be used with this unit. The Staple, Hole Punch Finisher supports single-position stapling for A4, A5, letter, legal, folio or oficio paper sizes, stapling up to 50 sheets per set (20 lb., 75 gsm). It also offers dual position job offset and job stacking. The output bin supports stacking of paper, card stock and transparencies. The Staple, Hole Punch Finisher supports finisher bin 'empty' and 'full' sensing.